Posted on 8 February 2013, in French Fridays with Dorie and tagged French Fridays with Dorie, orange, pork. Bookmark the permalink. 19 Comments. I agree about the orange freshness but not much flavor. It´s a bright dish though and it looks wonderful Betsy! I agree with Howard about the pork and port, it´s a fantastic combination, I have a recipe about it in my blog. Have a great weekend! Yes, I think that finding Nemo will not be too difficult this weekend. (The white stuff is taking over here too & all the schools are closed or closing early – but we are not projected to have anywhere near the effect you are). Stay safe! I did wonder how you were going to feed Howard fruited pork. Glad to hear you found almost domestic bliss :-) Brussels sprouts seem to have been a popular pairing with this week’s recipe. So many of us have good taste! Definitely try the sauce cut with dry white wine (I used) or basmatic vinegar some folks used. I’m with you this week. The sauce was not a big hit in my house either. Your mustard and white wine sauce sound much better. I’m so glad you liked those Brussels Sprouts, Betsy! And thanks for the link, too. We all enjoyed the dish, but agreed that there was a little kick missing. Maybe the brown sugar in the Sprouts helped round out the flavor a little. ;) Stay warm and cozy!! Just happy to know I didn’t have the only finicky husband this week :) Have a lovely weekend!!! book and lots of food. I also like your idea of a mustard-white wine sauce, sounds delicious. Betsy, as I am writing this comment, I am watching CNN and I hope that “Nemo” will not cause too much damage and /or electricity shortages – do stay safe, it looks sooo cold and stormy in the pictures. 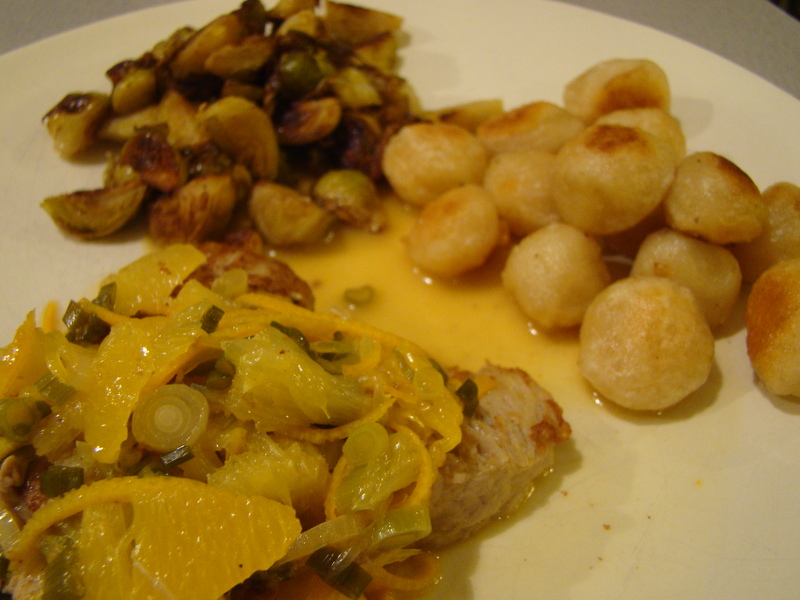 Your Orange Pork Tenderloin looks just wonderful and colorful – I love the side dishes that you chose, the pan-fried gnocchi and the roasted Brussels sprouts sound utterly delicious! What a great dinner! Have a warm and, most importantly, safe weekend! I like how you added the brussels sprouts to the plate. What a great combination! I hope that you, Howard, and Bella weathered the storm, Betsy! Your pork looks great. I agree with you on segmenting the oranges. We have had a few Dorie recipes where we have had to do this and you would think I would have mastered it by now – NOT! I did cut down on the orange zest, but I could taste the flavor combination in the sauce. The pork was perfectly cooked and moist and to me seemed so much flavorful than when I have roasted tenderloins in the oven. I will have to try both Nigella’s and Tammy’s recipes. They look and sound delicious. Glad that it all worked out for you in the end. I did think the pork itself was delicious, but didn’t love the sauce either. Poor use for a good orange! :) Hope you enjoy the weekend! I’m sitting here in Northern Arizona watching it snow too! Stay toasty! Hope Nemo didn’t cause you guys too much trouble! Sounds like you were ready for him! You certainly made a beautiful, sunny dish with the oranges and pork – glad you were able to make everyone semi-happy with it. Nice work! The ban on fruit and meats is a challenge. I am not a fan of segmenting oranges. 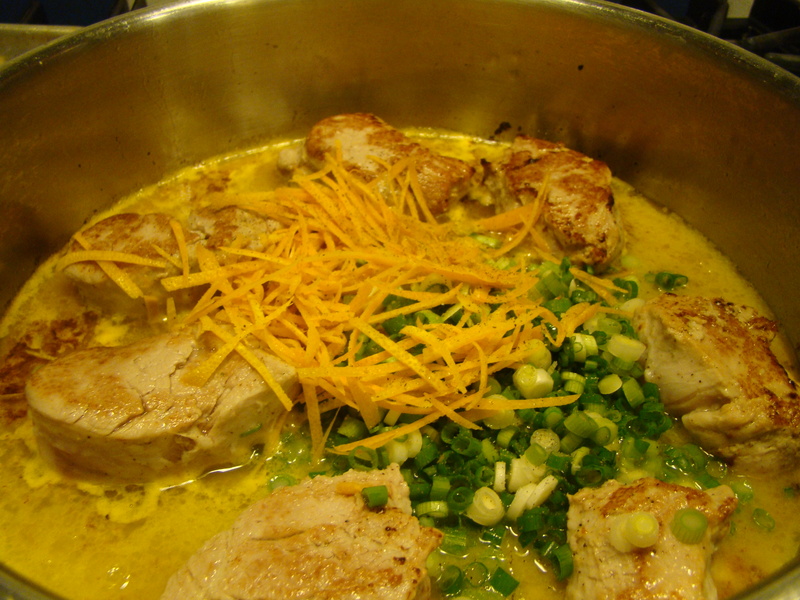 I would have been happier with this recipe had my pork medallions been tenderly delicious. They were a bit tough. After reading many of you colleagues’ Posts, I think it was more my error than Dorie’s (I just hate to be wrong!). Channeling my Mother who ALWAYS over-cooked pork so we weren’t diseased, I “gently simmered” for wayyyy too long. Your meal looks good, Betsy. I am especially intriqued by the Rapid Roastini which you and another Dorista discussed this week. I have copied out the recipe and will try this quick side to a meal. Stay warm. I’ve always thought of snow days like this as “free days you get back”. That curling up with a good book thing. I am currently reading “Where’d You Go, Bernadette?” by Maria Semple which is hysterical and a pleasure to read. An easy read, also. I think you’d like it. I love how you paired this dish. So sorry I am late in posting this comment. Have been playing catch up all week (though thankfully not due to Nemo) but have been thinking about you and how you weathered the storm. My son called to tell me he was not in “SnowBrawl 2013” and therefore I did not have to worry about him being the kid tasered by the police :) I had no idea about any of these shenanigans as the search for Boston/Nemo./Weather images showed many gorgeous photos with few people in them. Had to ruin it an make Mom worry :) Hope you did survive OK and without a power loss or other hardship. What a year, no ? And your pork as well as sides look amazing. I am with you about the prep time on those oranges and though my guys liked them- I don’t see myself knocking this thing out again. Stay warm !!!! I agree that the orange overwhelmed the other flavours. The concept has potential, though. I hope you weathered the storm well. you always find the best sides for your dishes! 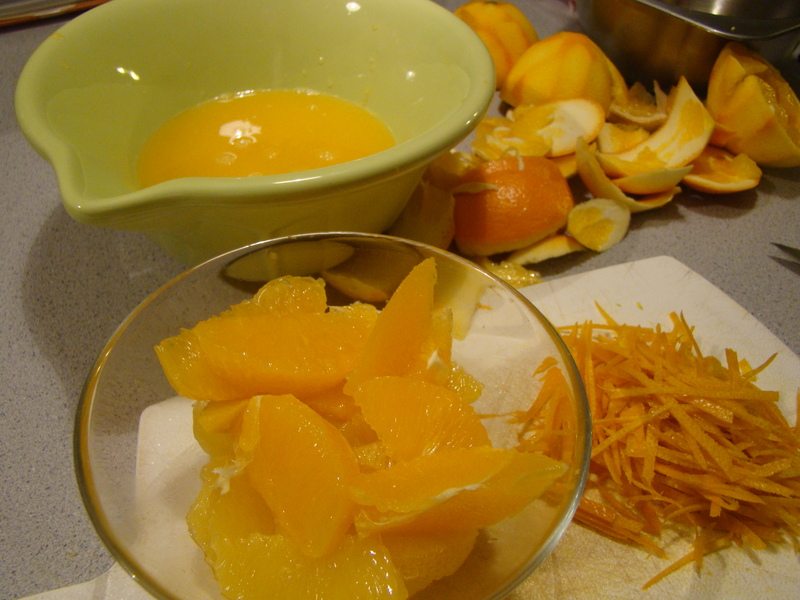 I think zesting the oranges and supreming just take some time to develop the skill – its goes fairly quickly for me now but it used to take me ages and ages!